On this day, October 27, 1914, the incomparable poet Dylan Thomas was born. 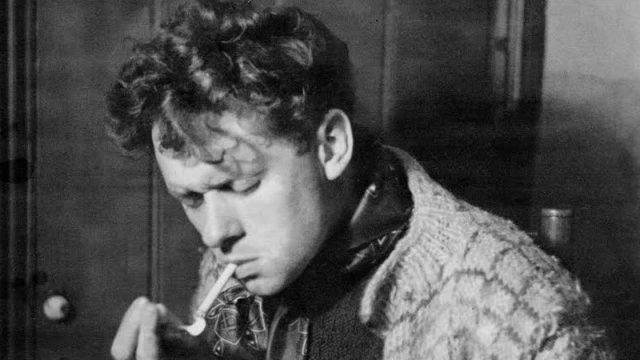 When people talk about Welsh poet Dylan Thomas, they often start with the fact that he died at the age of 39 after a massive drinking session. Sordid details of the wretched endings of artists who died before their time hold a morbid fascination for we ordinary folk, but it’s just wrong to shake our heads while commenting on their dissolute lives and the sorry manner of their deaths. Such things, while significant, do not define a person. Thomas was more than a pitiful alcoholic: he was a superior poet, someone whose mastery of language should be quietly savoured and loudly marvelled at. This poem is a villanelle, a 19-line poem with a tight rhyme scheme (aba, aba, aba, aba, aba, abaa) and you’ll notice that the middle lines of all stanzas rhyme with each other. There are five stanzas of three lines each, ending with a quatrain. Adhering to the strict poetic structure of the villanelle required mastery of the medium and Thomas had such mastery in spades, imbuing this poem with evocative imagery and raw emotion. Do not go gentle has been taken to heart by countless people since it was published in 1951. My own late mother embraced his clarion call to resist death’s beckoning finger with a particular vehemence in spite of the unutterable pain she suffered. Thomas’s words certainly tapped into the collective subconscious; they will continue to do so. Dylan Thomas grew up in Swansea, Wales in a family of readers. His father, a literature teacher, instilled in his children a love of verse and Thomas became engrossed by language from an early age, immersing himself in poetry and setting the groundwork for his own nascent talents. Having a poem published in England in 1933 was a turning point for him. He went to London, and his first collection of poetry, 18 poems, was published the following year when he was only 20. It received favourable reviews, marking him as a poet to be watched. Someone once commented that the poems in that volume were “individual but not private”; and while some thought the poetry difficult, others remarked that Thomas’s words were artistic, innovative and beautiful. One thing that came across was the young man’s love of words and of all the different meanings words can have. Later volumes included Twenty-five poems (1936), The map of love (1939) and Death and entrances (1946). Thomas’s poems are emotional works, sometimes high-spirited, all with their own rhythms. Rhythm was acutely important to him. There’s tension, a search for self or perhaps meaning; there are sexual and religious references, sin, forgiveness, humour and poignancy, and his work is imbued with a deep love of the natural environment. And the twice told fields of infancy. Thomas had a strong, resonant voice and did many a reading tour to supplement his income. Listen to him reading Poem in October. So very powerful. Thomas wrote from somewhere deep within and his words manage to capture something of the human psyche – “And the mystery sang alive.” Oh, to be able to write like Dylan Thomas. Thomas achieved fame very early in his writing career and it certainly had its downside when he adopted what others have called a “rock-star lifestyle” – drinking, sleeping around, you know the drill. He was often racked with self-doubt and insecurity about his work and used alcohol as a crutch. He had many affairs, something he continued even after his marriage to Caitlin McNamara in 1937. Theirs was a stormy union marked by a constant shortage of money, infidelity on both sides, massive arguments and a destructive excess of alcohol. Yet they loved one another and his letters to her are passionate – “it’s burning hell without you… I am profoundly in love with you, the only profundity I know.” When she was summoned to New York as he lay in his final coma in November 1953, Caitlin was so hysterical she had to be sedated. Thomas’s death left their three young children fatherless. Shortly before his death, his comic “play for voices” Under Milk Wood had its first stage performance in New York, with Thomas himself reading some of the parts. This brilliant work had a long gestation. Many of the more than 30 characters from his fictional Welsh seaside town of Llareggub (“bugger all” backwards) had been developed over a 20-year period. Blind old sailor Captain Cat pines for his long-dead lover, Rev Eli Jenkins spouts poetry each morning, Dai Bread has two wives, Mr Pugh fantasises about poisoning his wife – we are privy to their innermost aspirations. The language is brilliant, pure poetry. Who else but Dylan Thomas could come up with the line, “the sloeback, slow, black, crow-black, fishingboatbobbing sea”? Sadly, Thomas never heard his play performed by Welsh actors, but in early 1954, his great friend and fellow countryman, actor Richard Burton performed First Voice in a BBC Radio production. The play was made into a film in 1971 starring Burton, Peter O’Toole and Elizabeth Taylor and in 2015, the first Dylan Thomas Day was held on 14 May – the date of the first reading of Under Milk Wood back in 1953. There’s so much more to explore with Dylan Thomas. He was a screenwriter for a time, his poetry is among the finest in the English language and his prose works are comic and insightful. His sense of rhythm and his genius with words tower over the tawdry details of his passing.